i’ve been posting quite a bit of personal stuff lately. but i guess that is “blog,” so i won’t apologize. and i won’t apologize for another personal post. lately i feel like i’m drowning. responsibilities keep piling up, bills keep piling up while money keeps flying out the window, family drama keeps piling up, dishes and dust keep piling up, all while my self worth keeps taking a nose dive. i’ve been doing good to keep the panic attacks from last week at bay, but there are still times when my body feels stricken with anxiety. when mid thought, mid sentence, mid action, my body is overcome with the physical manifestation of stress. 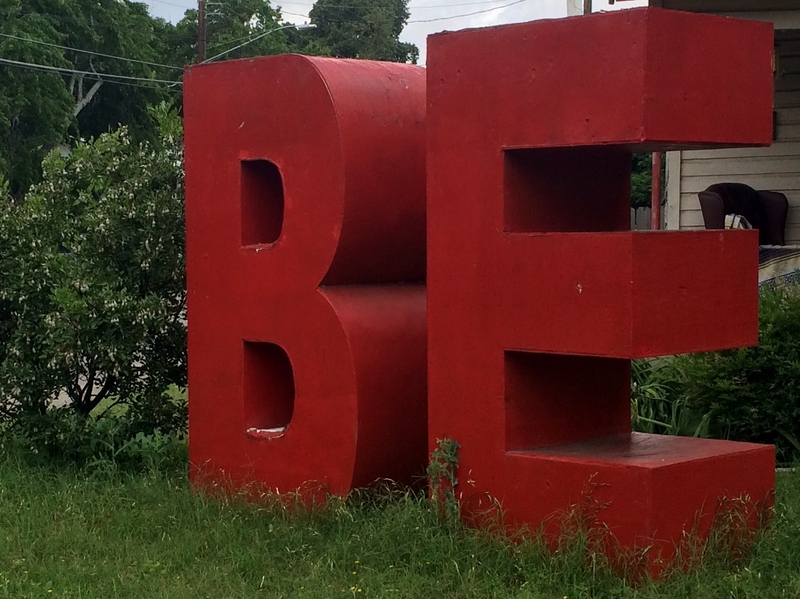 today, i remembered seeing this be-e-a-utiful reminder in the yard of a friend’s neighbor over on the east side. so, i had decided to make a detour on my drive into the office to go take a picture. a reminder that at the end of the day, all i have to do is just live to be. hopefully it’ll stick.